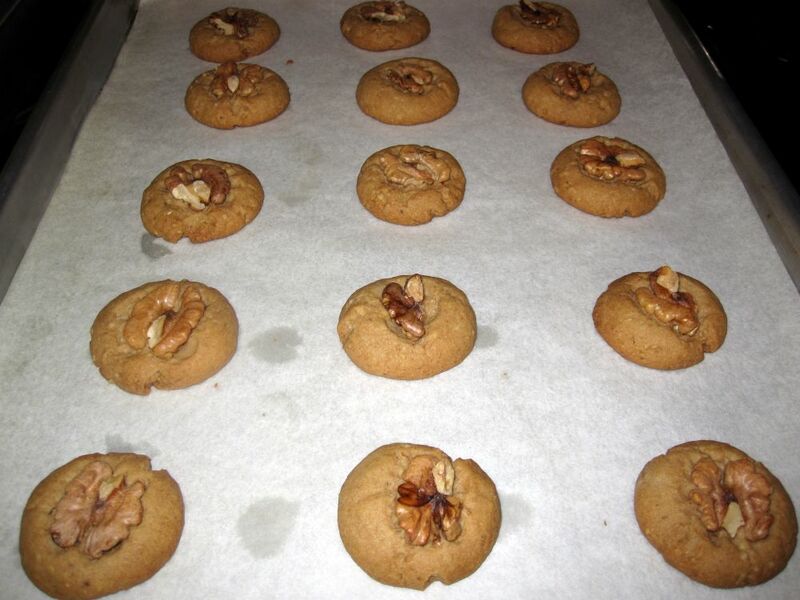 On one of my trips up to the Bay Area (which if you know me is a very frequent trip), one of many things I watched my mom bake was this recipe for Maple Walnut Cookies. 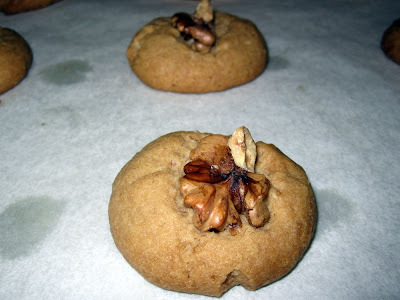 The kitchen smelled great from the intense aroma of maple, and my mom was having a blast shaping each cookie on the baking sheet, first as a ball, then sticking a walnut on top and pressing it down to flatten the cookie. Her "having a blast" is actually putting it mildly (and I'm sure if I haven't already, I'm about to embarrass her). Her giddiness at seeing the walnut press down the cookie suggested she had either spiked whatever beverage she was drinking (highly unlikely if you know my mom) or it was late enough at night that the giggles had overcome her (totally likely...and it's genetic...she definitely passed the giggle gene on to her kids). 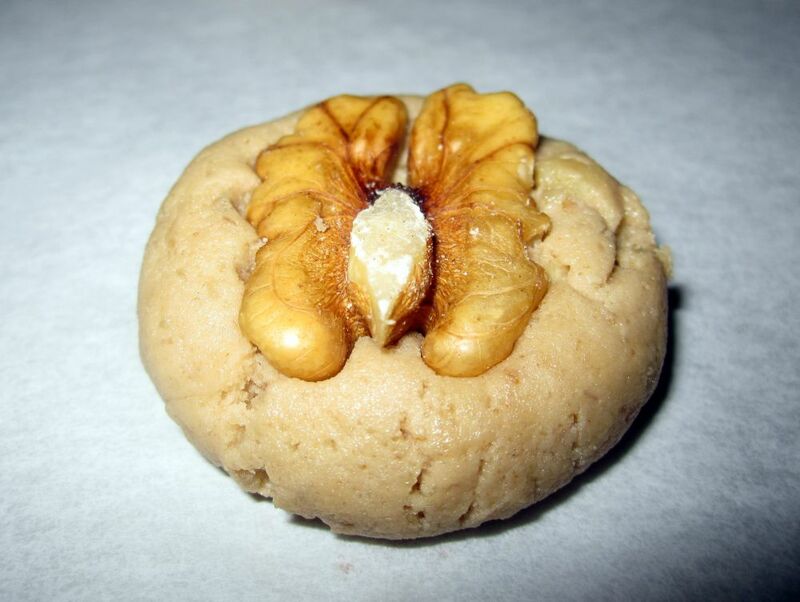 She even called me over to experience the fun of pressing a walnut into the cookie. And when I came over to her "work station" to shape a cookie on her baking sheet, sure enough, she was right; it was a lot of fun! If anyone ever asks, "What is it about baking you like so much?," I'd have to say moments like these are some of the best. Watching my mom get excited about something as simple as pressing a walnut into a cookie says a mouthful. :) We truly love baking. 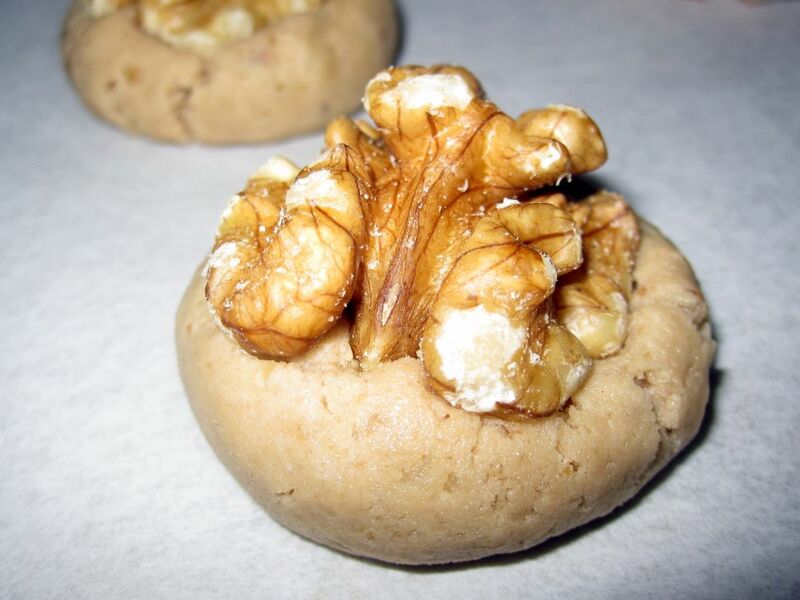 In a food processor or a blender, coarsely process the 1 cup of walnuts. Add 1/4 cup of the brown sugar and process finely; set a side. In a large bowl, combine the butter, the remaining 1/2 cup brown sugar, maple extract, and salt. Using an electric mixer set on high speed, beat until light and fluffy. Reduce the speed to low, add the flour and the nut mixture and mix until just incorporated. From the bowl of cookie dough, grab enough dough to form into a 1-inch ball using the palms of your hands. Continue until all of the dough is used. 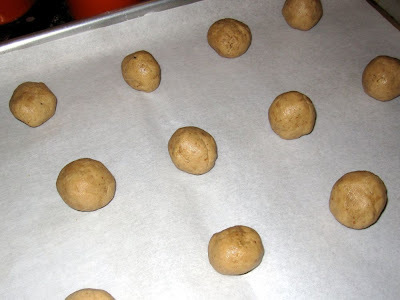 Place the dough balls about 1 1/2 inches apart on an ungreased cookie sheet. Press a walnut half onto the top of each. 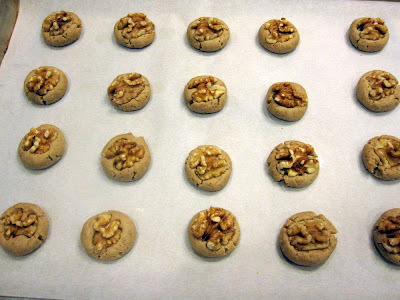 Bake the cookies until brown around the edges, about 20 minutes. My oven cooks fast so my cookies were done in less than 20 minutes. Perhaps check at around 15 minutes. 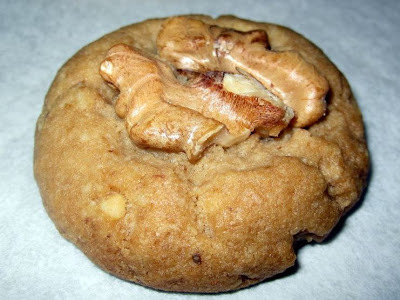 Either way, this is a more crunchy, less chewy cookie. Transfer the cookies to a wire rack to cool. Store in an airtight container at room temperature for up to 5 days or freeze right away to enjoy later. You are right...I do love baking! And I am so lucky to share the fun with you! Thanks for reminding me of one of our many wonderful baking memories!! 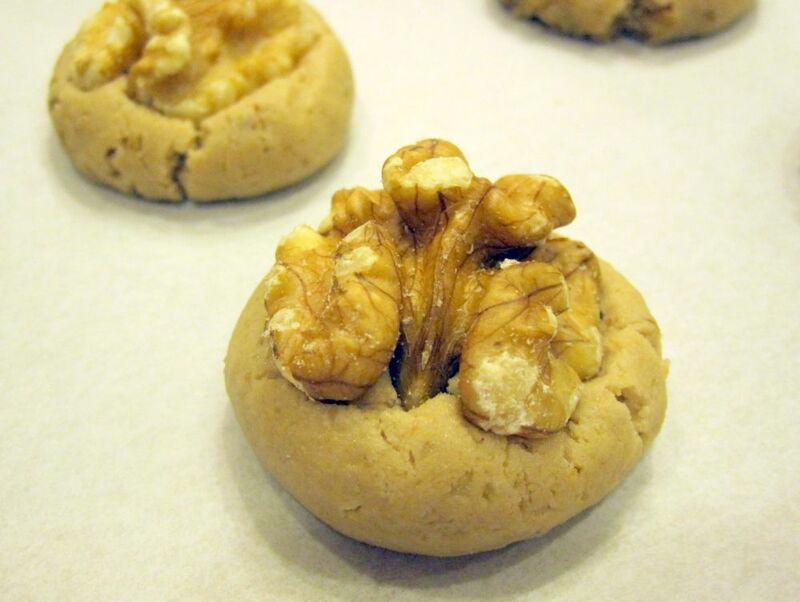 I have always adored the combo of walnuts and maple. Mmm, these sound like a perfect addition to my holiday cookie baking.